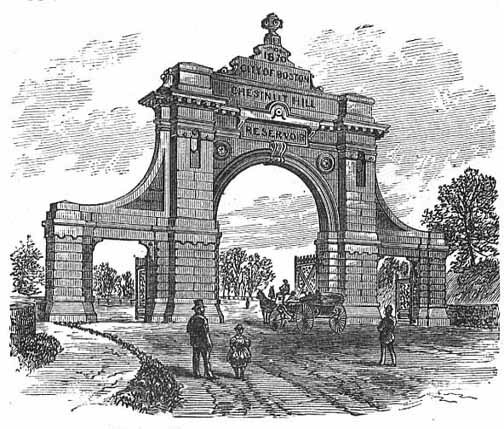 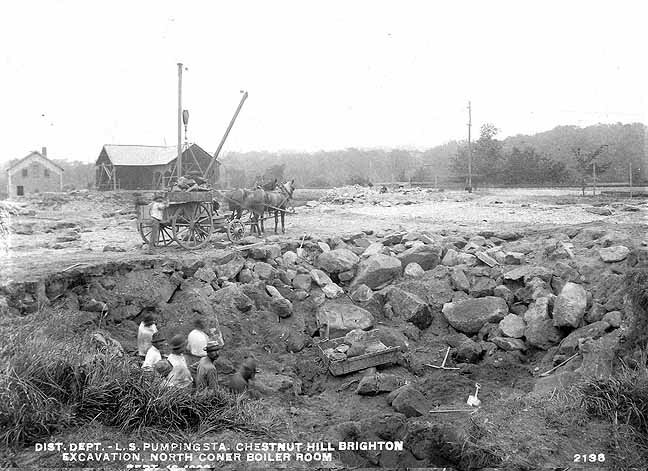 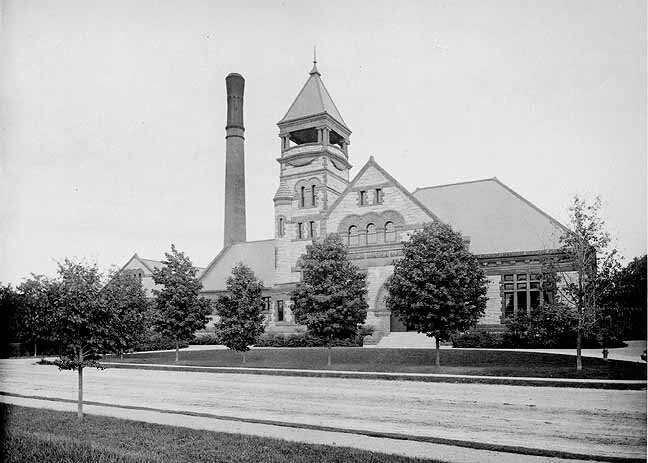 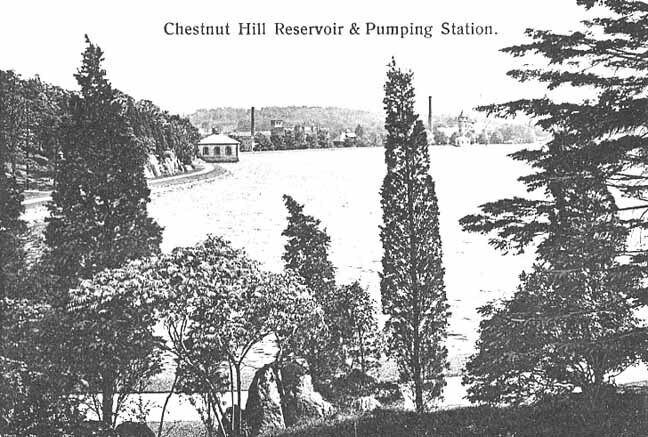 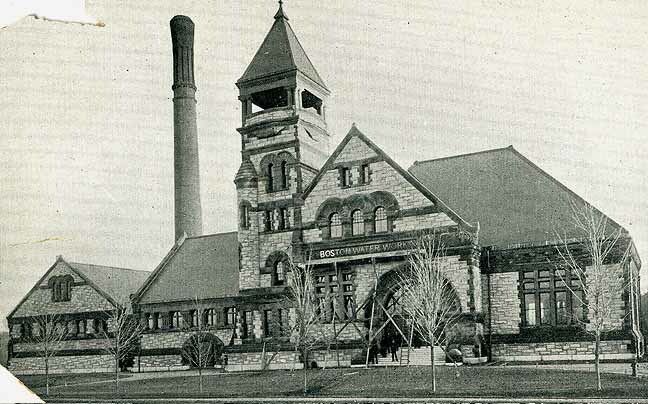 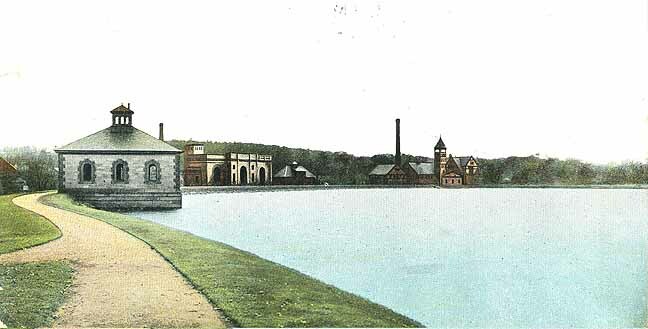 The Chestnut Hill Reservoir was constructed between 1866 and 1870. 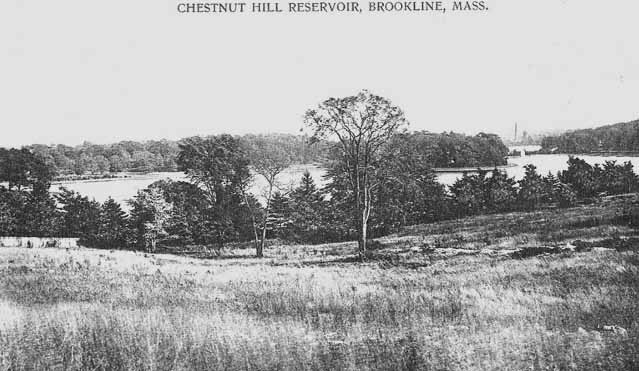 212 acres were purchased from local landowners to build the reservoir. 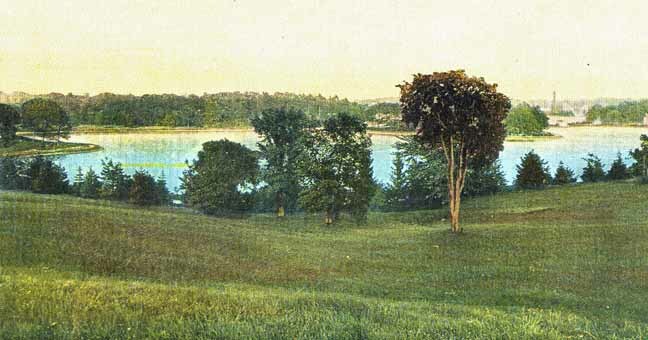 58 acres came from the estate of the textile manufacturer Amos Adams Lawrence whose estate stood on the heights where Boston College was constructed. 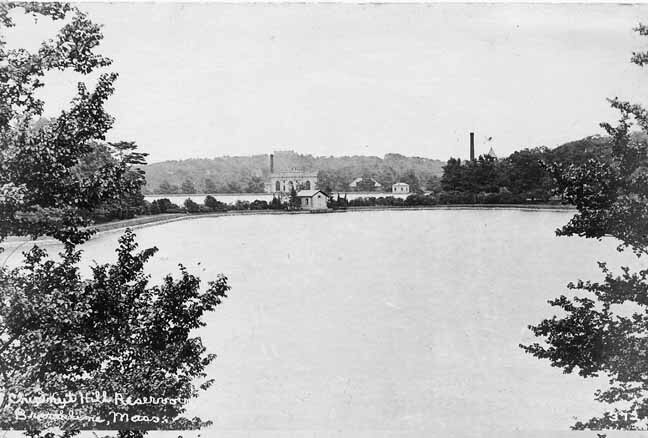 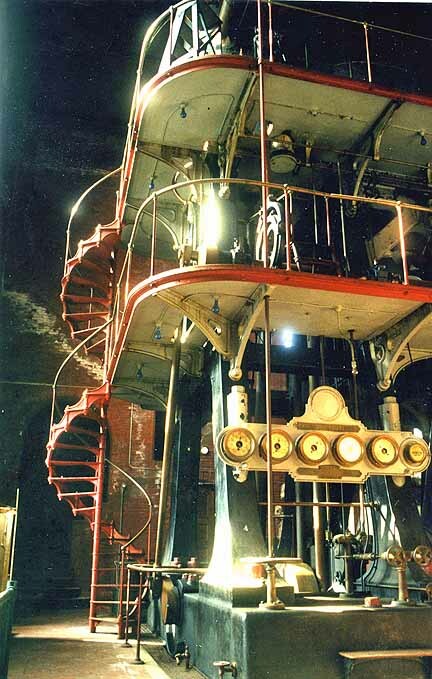 The Lawrence Basin was named after Mr Lawrence and was phased out of use after the construction of the Quabbin Reservoir. 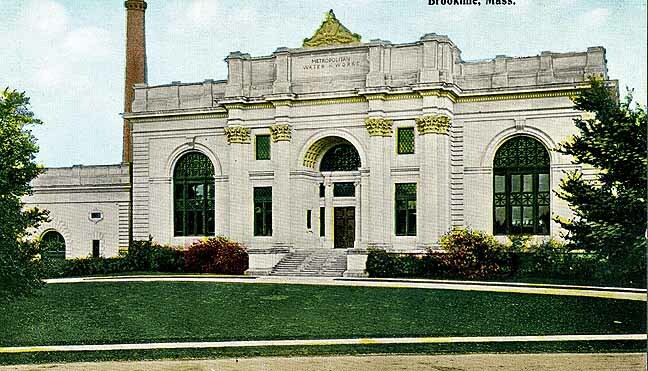 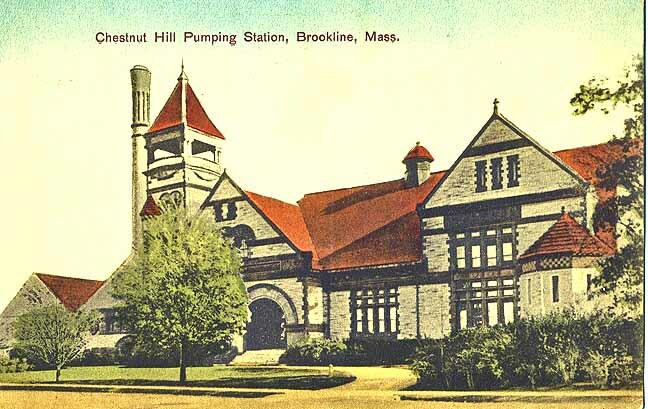 It was sold to Boston College and filled around 1950. 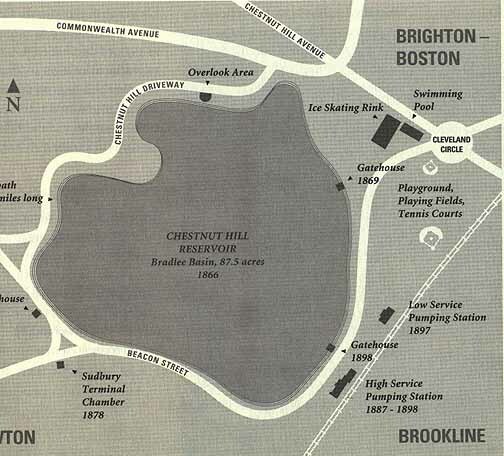 It is now the site of the BC Football Stadium and dorms. 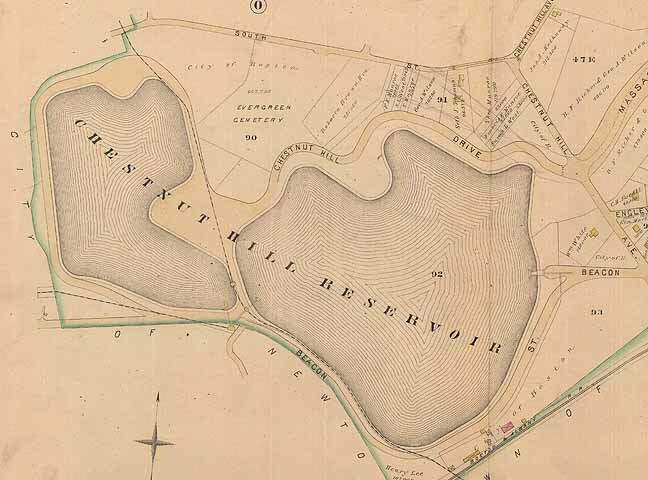 The Bradlee Basin was over twice as large as the Lawrence Basin and was named for Nathaniel J. Bradlee, the Cochituate Water Board president at the time. 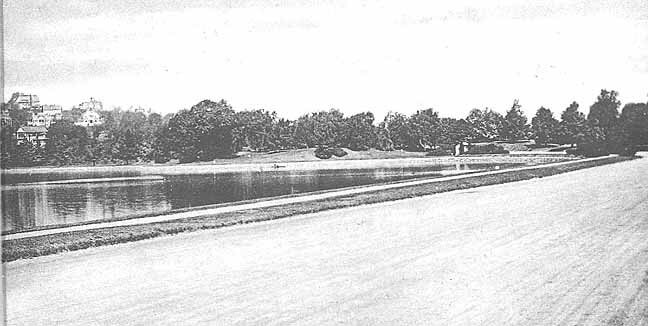 The 80 ft-wide, winding drive afforded views of the water and surrounding grounds, and was a popular destination for pleasure drives. 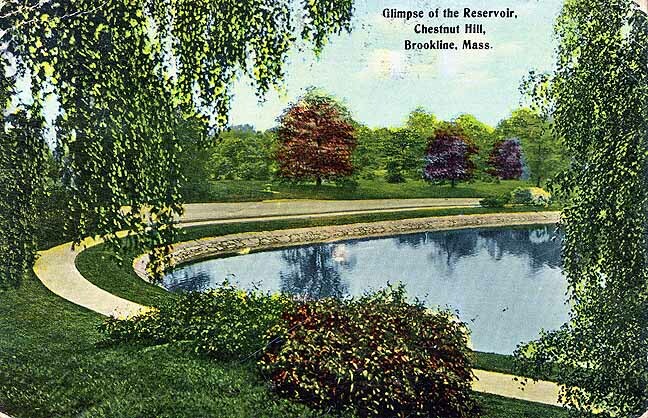 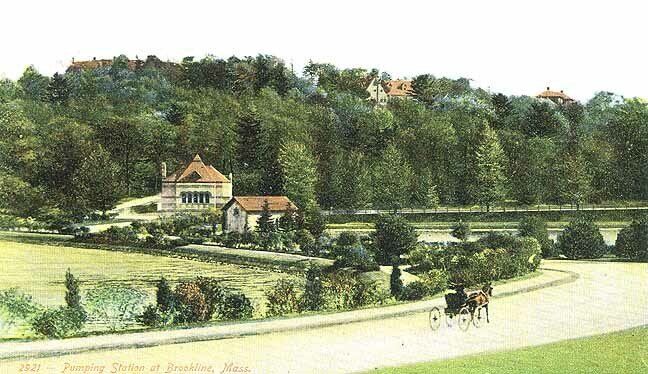 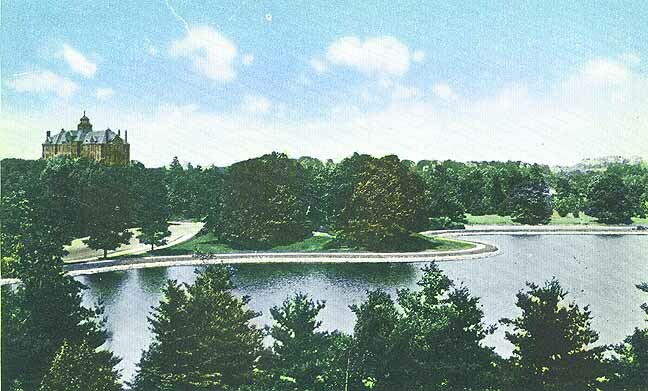 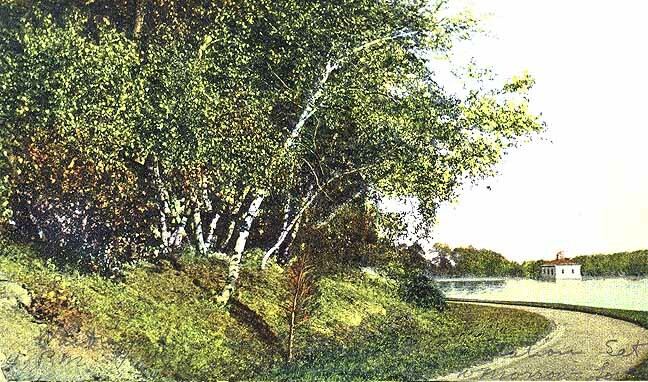 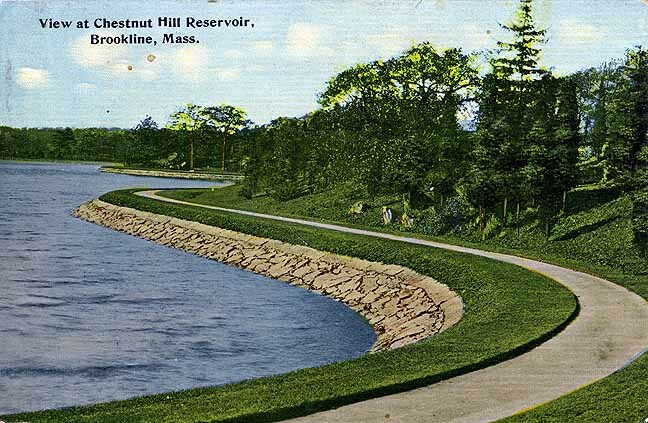 Contemporary guides noted the tree-covered hills and flowering shrubs along the reservoir banks, referring to the reservoir as a "great pleasure resort" and to the drive as "the most popular drive in the city." 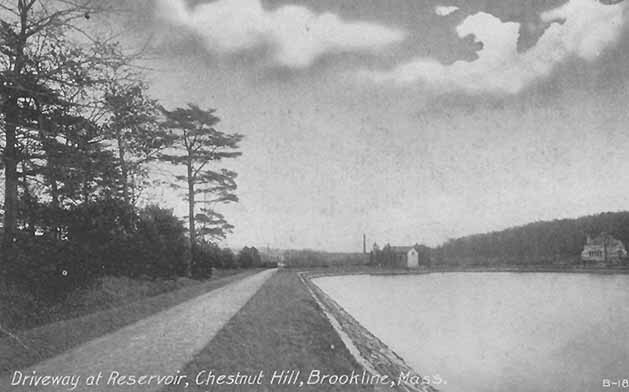 The drive survives, at least in part, as the present-day Chestnut Hill Driveway, which runs along the north side of the reservoir. 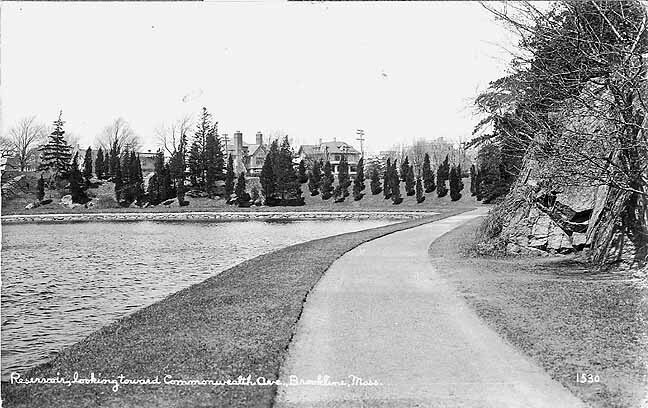 St Thomas More Rd (the road between the two Basins) with the Lawrence basin on the left with Commonwealth Ave homes also on the left. 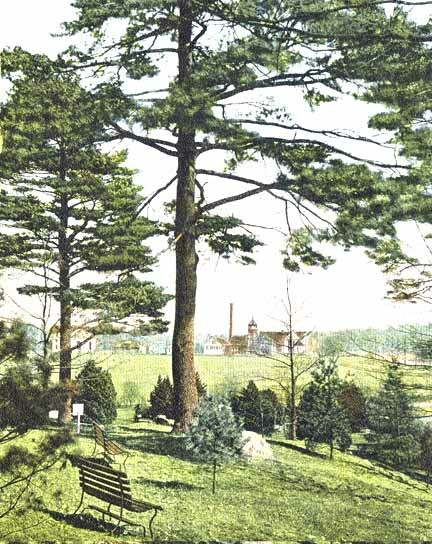 The Evergreen Cemetery would be on the right. 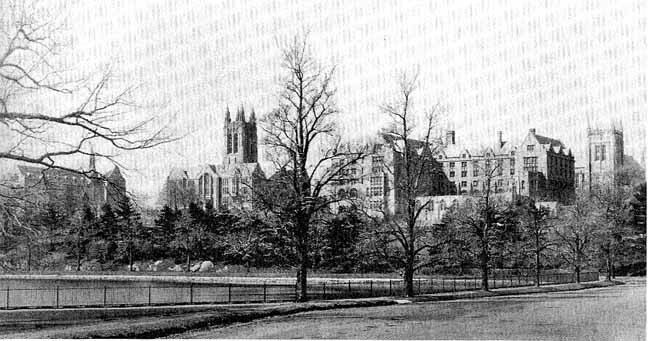 The St Ignatius Church location would be near the center of the photo. 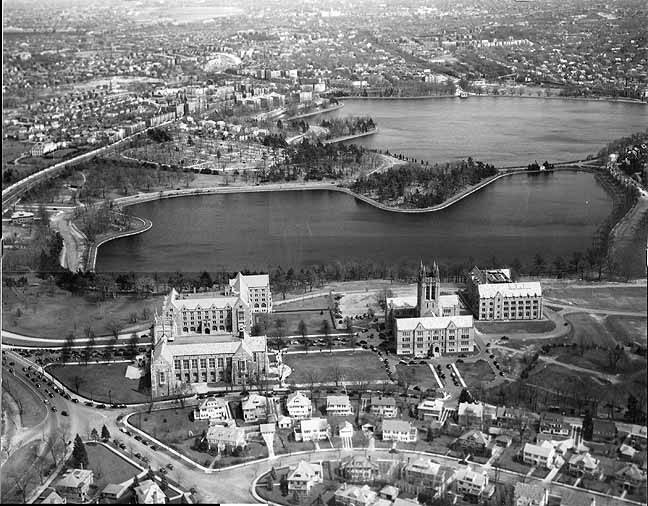 Beacon St and Thomas More Rd (center) with the Lawrence Basin on the right and Bradlee Basin on the left. 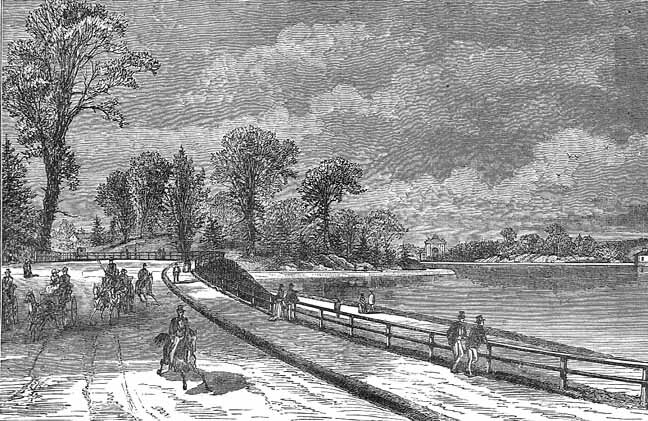 Chestnut Hill Driveway is in the foreground with the Horse and carriage.